Life Haven Incorporated is an organization duly registered at the Securities and Exchange Commission (SEC) on July 7th, 2005. We are guided by the Independent Living Philosophy, teaching and sharing this to others as part of our active participation in the Independent Living Movement. We envision a society where people with disabilities are independent, self-determined and participates actively in promoting self-development. It is our mission to lead the establishment of Independent Living centers in the Philippines as its vehicle towards full empowerment, integration and participation in the community. 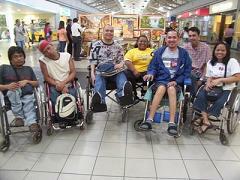 Our goals are to lead and promote IL philosophy and concept among PWDs and non-PWDs. To equip PWDs with the necessary knowledge and skills to exercise the IL philosophy and concept. To define the criteria of an IL center based on Japan Council on Independent Living Center. To mobilize resources both local and foreign in the establishment of IL centers. To work in partnership with other organizations who share similar aims and objectives. To provide other services that might properly be considered appropriate for the furtherance of the aims and objectives of the organization.